Guys! In this profile, I post only *DRAWINGs*. 1 character (original or fanart) on a neutral background ≥ 30 euros. With background - 50 euro. Warning: the background in my arts takes no more than 30-40 percent of the picture, also I don't paint landscapes without personges. Portrait with your photo ≥ 80 euro on a neutral background. With background - 100 euro. To order write me a letter here and we will discuss the details and the method of communication. Payment by PayPal, the percentage of Paypal is paid by the buyer. Cudzinec has started a donation pool! Happy Birthday dear Elena! 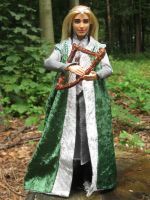 Thranduil is playing just for you!